If you are a romantic person I bet you are always thinking about how to show how much you love her or him, what to do, what to buy, where to go, what to watch and many other things, so, if you are one, Valentine's Day is a really important celebration. 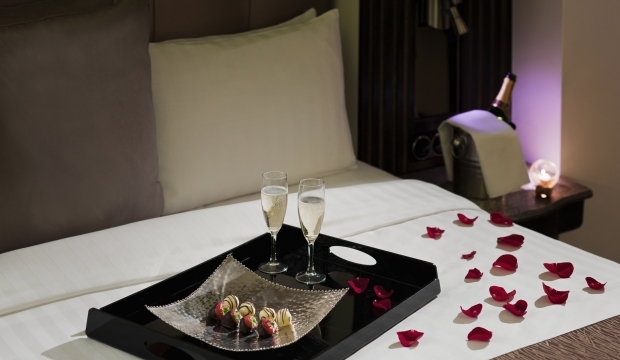 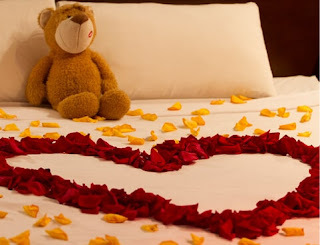 Do not miss the opportunity to surprise the person you love with a detail as nice as a romantically decorated bedroom for your celebration on Valentine's Day, and if that is not enough for you, don't worry, you also can give her or him flowers, a Teddy Bear or any other classic gift. 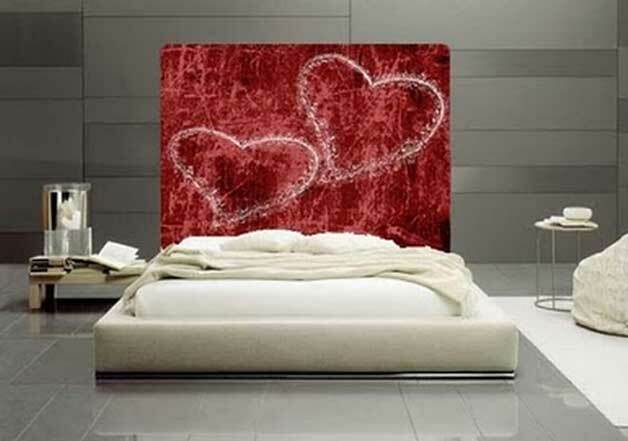 In this first image we have a panel behind the bed with two white hearts in silhouette on a red background. Or if you prefer you can opt for two swans adorned with red petals around. 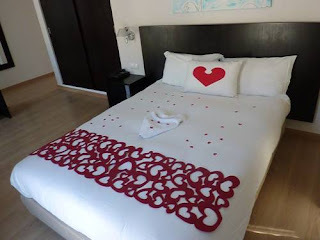 It is also a very good option a big heart in silhouette made with red petals and in the middle, a pair of red roses. 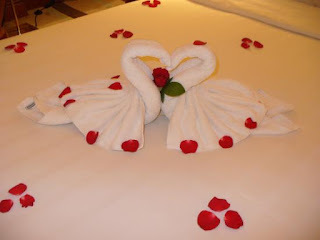 In this image you can see how well your room could look with details as simple and romantic as these. 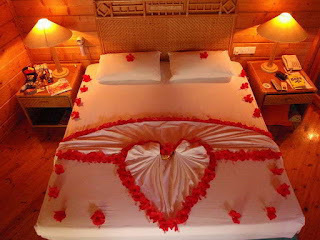 If you feel that one heart is not enough, in this bedroom you have a bed full of hearts. 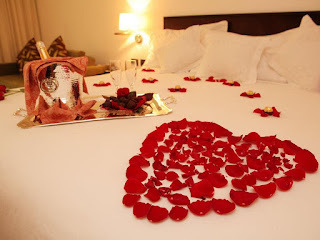 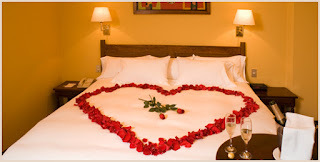 Imagine red petals on the bed and on the floor, as well as red and white heart-shaped balloons. If you are not satisfied with a heart of red petals, a bottle of champagne and some fruit or snacks, so you can include a bouquet of roses. A good idea is to place a teddy bear on the bed, the impression is very positive. 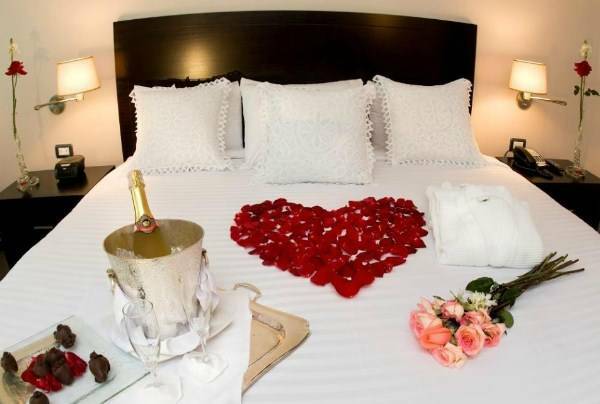 Do not forget that you can decorate the room but also you can add a bottle of champagne and some snacks that both prefer. Imagine his or her face with a bedroom as well decorated as this.